We often talk about this site as a marketplace, but until now there's been something important missing - money. That's all about to change, though. We're working on the first version of the School of Everything payment system. This will give anyone who wants to take payment for their teaching online a simple way to do it. If you're interested in having a preview of this, we want to hear from you. Just to be clear, we're not going to start charging for any of the existing services on the site. It will still be free to create your teaching and learning profiles, to contact teachers through the site and to get contacted by potential students. And we don't want the site to be all about paid teaching. We're passionate about peer learning, mentoring, skill-sharing and all the other ways that people can learn together and pass on knowledge for the love of it. But we do know that a lot of you currently make a living as freelance teachers, or are trying to build up to a point where this becomes your main income. We want to build tools that make your lives easier. Everything gets more serious when money's involved, so we want to be clear about what you can expect. You can be confident that what we're building will work and will be safe to handle money through. At the same time, we want to be humble about what we can achieve with the first version. This will be a first step towards something really useful, but it's only one step. One place I found myself thinking out loud about this was on this post from Tsheko. He made a reasonable response: "I wouldn’t be encouraging my sons to rethink tertiary education unless there was something to replace it." I was still thinking about that, when I came across a post from Jeff Thomas Cobb at Mission to Learn, talking about Seth Godin's recent offer of an "apprenticeship/not-internship/graduate school/charm school track-changing opportunity" with him this winter. Whether your goal is to start a business, learn a trade, or become a better artist, writer, or musician – just to name some of the possibilities – there are people out there in your community who would be willing to mentor you for some period of time in exchange for your labor or perhaps modest payment. Find them through Craig’s List, local organizations like the Chamber of Commerce, or perhaps by using a site like School of Everything. I love the idea that School of Everything can contribute to opening a wider range of paths through life - or just making the other paths that were always there more visible. And I'd love to carry on this conversation, on this blog or elsewhere. Do we need a "replacement" for higher education as it currently exists? If you work in a university, what changes have you seen - and where is the system heading? What would a University of Everything look like? 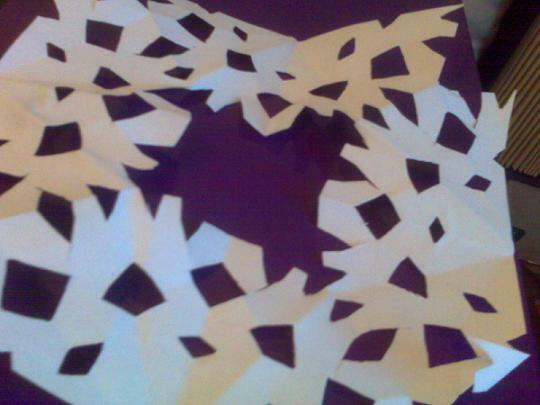 Well, you know what they say, every snowflake is unique. Some are just more unique than others. ...what you can learn if you practice every day. Over the past decade, the internet has changed the way we organise whole areas of our lives. From email to online reference resources and newspaper websites, it offers cheap and easy access to information and people around the world. With online shopping and banking, services you once had to go to now come to you. These examples have one thing in common: each offers a way of doing things we were already doing, but with distance – and the associated effort or cost – removed from the equation. More recently, however, another way of using the internet has emerged. An increasing number of sites harness the power of the internet to help us do things we didn't do before in the places we're already in. Around the UK, 1.6 million people now belong to a local Freecycle group, offering their unwanted possessions or posting requests for items they need. This simple network can be just as invaluable to a young person furnishing a flat on a shoestring as to those downsizing towards retirement, while many voluntary organisations have discovered its potential as a source of free equipment and materials. The American site, Meetup.com, allows anyone to start a group, organised around a shared interest, which meets up regularly in their town or city. (Interestingly, the most active early users of Meetup have been ‘stay at home mums’, with nearly 2000 groups and 100,000 members – an experience which echoes that of the Open University, nearly 40 years ago). Where the first generation of internet activities resembled television, in that they encouraged us to spend more hours of our lives in front of a screen; this second group has more of the spirit of the programme the BBC used to show in the school holidays, Why don't you just switch off your television set and go out and do something less boring instead? So what are the implications of all this for education and training? From its early days, the web has been seen as a means for learners to access information and for learning providers to deliver content. More recently, the potential has begun to be recognised for learners themselves to create, share and discuss in virtual learning environments. But the growth of the 'Why Don't You…?' web suggests another possibility: the internet could become a means to find others to learn with or from in your local area. That is the possibility we're exploring with School of Everything, a new website developed with funding from Channel 4 Education and the Young Foundation (which carries on the work of the founder of the Open University, Michael Young). People use the site to offer their knowledge and expertise, to arrange paid teaching or informal skill-sharing, or to post requests for learning. The site launched in September and already has thousands of teachers and learners listed. Our hope is that it can play a similar role to Freecycle or Meetup, making accessible the resources of formal and informal learning providers and of the community as a whole, leading to richer webs of learning relationships. The Christmas lights are up on the High Street and mince pies are selling like hot cakes. School of Everything has got into the Christmas spirit by putting together an advent calendar of daily lessons on all things festive. Sign up to our 'Snow Everything' Christmas e-mail and we'll send you something seasonal to learn every day from the 1st - 25th December. Knit your own stocking; cracker-making; how to cure a hangover - it's stuffed with goodies. Treat yourself - sign up on the right. And you can share your own festive tips by adding notes, videos and links to the Christmas Scrapbook too. London Free School - This Weekend! 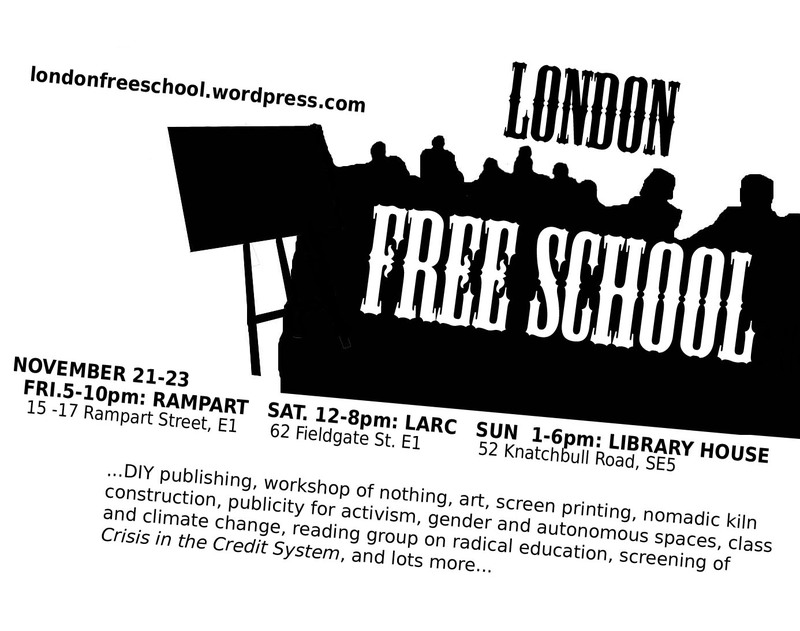 If you're in London this weekend, take a look at the London Free School weekender. There are all kinds of sessions from recycled glass fusing and clothes making, to a discussion on permaculture and the mysterious-sounding "Workshop of Nothing". It's all happening at three of London's most active social centres - rampART, LARC and The Library House - places that embody the self-organising approach to education (and life in general) that inspired us to start School of Everything. So get down to some of the sessions this weekend - not only will you learn a lot, but you'll meet some very interesting people. Myself, I'll definitely be at the Self-Education meeting on Saturday night, because I'm interested in how what we're doing with School of Everything connects to the wider picture of self-education internationally. I'm also tempted by one of the workshops on Sunday afternoon - how often do you get the chance to learn Nomadic Kiln Construction? It's been such a busy week, I've only just go round to blogging that we had a lovely piece about us in the Guardian on Tuesday. Lucy Tobin really spent some time trying out the site to find herself a digital photography teacher and talking to people who had used the site to find a teacher. It's great to see an article where the School of Everything community is in the foreground rather than it just being about us as a company (although those are nice too!). And there were already twelve people who'd signed up to learn smiling, just waiting for a teacher to come along! The Web can be a great way to promote your teaching - as long as you keep it personal and focused, and remember to spend some time actually teaching, says Jason Priest, founder of guitar studio Little Rock Jams. Jason left a corporate career to start his guitar teaching studio, and has never looked back. "I often say I haven't worked a day since I left corporate life," he says. "I've put in many more hours running my own business than I ever did in an office; but it doesn't feel like working because it's what I want to do." As well as being committed to teaching, Jason is well-versed in the Web. I asked him: where do guitar aficionados hang out online? "It's insane, the quantity and quality of guitar content on the Web," he told me. "To the point that guitarists may spend more time surfing the Web than they actually do playing/practicing. As a musician, you should spend more time with your instrument rather than your laptop - that's my teacher side coming out!" There's a few guitar websites he'd recommend, though. "For gear talk, there's only one place: Guitar Heads. Plus, the two guys running the site, Gary and Dan, love what they do - and they have a great community with guitar reviews, contests, forums, video tutorials, guitar lessons and a lot more." 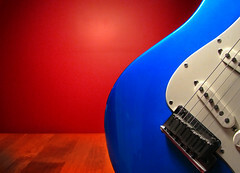 Jason also recommends From The Woodshed, the personal blog of guitar music scholar Joe Walker. As well as hanging out with other guitarists in communities and blogs, Jason has built Little Rock Jams into a friendly resource for anyone interested in learning guitar, whether they're likely to become face-to-face students or not. This was always part of Jason's strategy: "From the moment I wrote my business plan for Little Rock Jams, I knew the Web would be a key element to promoting the studio and attracting students. It really is a no-brainer, considering that my market is a niche market." With a bit of work, the Web can provide for free or nearly-free as much advertising as a teacher could need, as Jason points out: "In this Google Age, traditional advertising forms such as print and TV/radio get you less for your dollar than simply having a good site with quality content. If you can get up in the search engine rankings for your keywords, then you'll have a steady stream of hits to your site and calls to your business." This doesn't have to be an all-absorbing pursuit: "I would say I spend an hour or so a day working the blog, publishing guitar videos, moderating comments, promoting the site and so on," he says. So what are his tips for getting your teaching out there like this? The key thing is to keep it personal, he says, for example in a teaching blog: "I'm a blog guy. I favor the "real person" approach to guitar talk more than a corporate page." So does his online activity actually bring Jason new real-life guitar students? "Yes, most definitely. Our belief is that if we do a good job in our lessons and how we come across on the website, potential students can essentially "try us out" before calling. They'll have a feel for how we play, our musical interests and personalities and a chance to see the studio."